JEE Main 2019: National Testing Agency (NTA) will be conducting JEE Main Examination with the first session to be held in January 2019. As per the recently introduced changes by Ministry of Human Resource Development – MHRD, the Joint Entrance Exam (JEE) Main will now be organized under the supervision of newly formed National Testing Agency (NTA). The NTA is formed with the purpose of conducting national level competitive exams such as JEE Main or NEET. According to the statement by Union HRD Minister Prakash Javadekar, JEE Main will now be conducted twice in a year, once in January 2019 and another one in April 2019 but there will be no changes in the pattern of the examination or the syllabus of JEE Main exam. 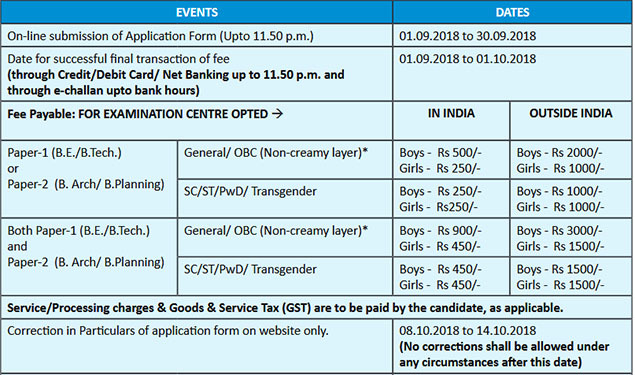 The NTA has released the schedule of JEE Main exam, the Application Forms for January 2019 and has started registration from September 01, 2018. Forms for JEE Main April 2019 exam will be made available in the month of February 2019. For more details regarding JEE Main 2019 application go through the article below. The JEE Main 2019 Application Form has been released on the official website of National Testing Agency (NTA) nta.ac.in and also on JEE Main website jeemain.nic.in. Candidates planning to appear in the examination are required to fill up the Online Application form and submit it before the due date. Candidates should note that the details mentioned in the Application form should be valid and correct, and any form of misleading information will lead to the cancellation of the candidature. The details provided in the Application form will include the sections of personal, academic and contact details. Candidates should make sure to enter the details very carefully as the further procedure will be on the basis of the details mentioned in the Application Form. The JEE Main 2019 Application Form is currently available on the official website of National Testing Agency (NTA) nta.ac.in and also on JEE Main website jeemain.nic.in. Candidates are advised to go through the eligibility before filling the Application form and make sure that the details entered are valid and correct. Go through the mentioned steps for filling up JEE Main Application Form successfully. Step 1: Visit the official website of the National Testing Agency i.e. nta.ac.in. Step 2: The link will be provided in the above corner of NTA Homepage named NTA exams. Scroll down on the Engineering exam link from all the other options listed under NTA from the main page. Step 3: Click on the Link named Joint Entrance Examination. The Registration Button is available on the page below. The Registration Button will be for the candidates visiting the portal for the first time and the Login button will be for the already registered candidates. The last step of filling up the Application form is submission of the Application Fee. Candidates are required to make the payment of the amount as mentioned. The amount of the JEE Main 2019 application Fee is uploaded online. However candidates can also refer the following chart. Since the procedure of submitting the Application form is entirely online this year, the submission of the fee is also online through Credit Card, Debit Card and Net banking, and also through e-challan as mentioned in the above chart. Aadhaar Card will be mandatory for filling up the Application Form. The Application forms of JEE Main 2019 is available online. For January 2019 exam the application forms is live from September 01, 2018. The last date to apply is online is September 30, 2018. Students can however pay fees till October 01, 2018. The Application Forms of JEE Main 2019 is available on the official website of the National Testing Agency nta.ac.in and jeemain.nic.in. Candidates will have to upload the scanned documents as mentioned in the brochure. Multiple Application forms filled up by one candidate will be rejected. The submission of the filled Application form can only be done online. There will be no provision of submitting it offline. Candidates appearing for JEE Main 2019 can also enroll for Test Practice Centre (NTA TPC) near their location. The JEE Main Pracitice Test will be fully online as the JEE Main 2019 is also online Computer based test. ResoNite Pawan Goyal, maintaining the league, secures AIR 6 with highest marks 350/360 in JEE (Main) 2018.